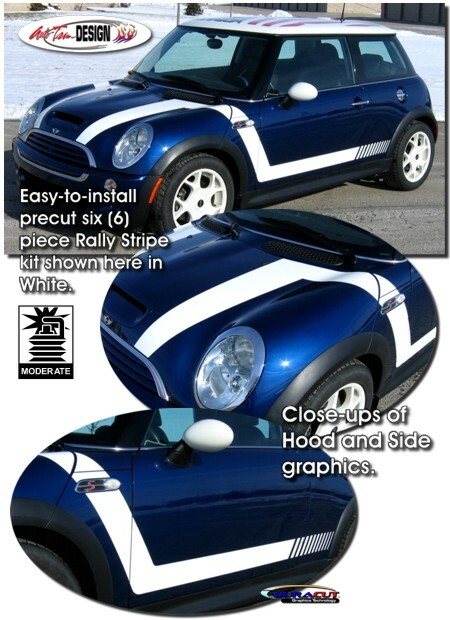 Spice up your '02-'06 Mini Cooper with this unique Hood, Fender & Side Rally Graphics kit. Graphic design consists of a contoured hood stripe with an accompanying piece that drapes down the front fender and pulls to the rear with a 4" (10.16cm) high stripe. They're PRECUT and ready to install in a wide variety of colors with very little trimming required (door jambs and fender connections). Six (6) piece kit consists of prefitted and contoured pieces made specifically for the '02-'06 Mini Cooper as shown in the illustration and will not fit any other vehicle. Kit includes general online application and care instructions.